With massive terrace fields across the green mountains, the view of the beautiful Himalayas of the Kumaon region is the most scenic view that can grab the attention and interest of the tourists from across the world. You will be moving on a flat route while passing through valleys in the Almora district of the Kumaon. You will be crossing small rivers, towns and villages on the way while biking in Kumaon. Motor biking tour in Kumaon will start from Corbett National Park, where you can even enjoy Jeep Safari to Dhikala Forest Lodge. You can take pleasure of Jeep safari inside the core forest area surrounded with dense forest and rich wild life. Further, you will be biking to Binsar bird sanctuary, where you can see a variety of birds. Moving ahead to Munsiyari, you can enjoy fishing over here. This biking track will give you a chance to explore Magmite / Stalmite caves of Patal Bhubaneshwari that depicts the legends of The Mahabharata; Chaukori famous for offering amazing views of Himalayas; Mukteshwar famous as the fruit bowl of the Kumaon and Ramgarh for its Apple, pear and peach orchard fields. 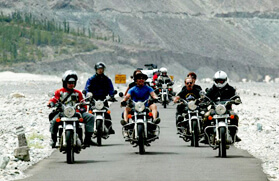 Biking in Kumaon region is certainly one of the best means to explore the natural beauty of the place. It will allow you to witness splendid views of the thick forests, murmuring waterfalls, snow-covered mountains and much more. 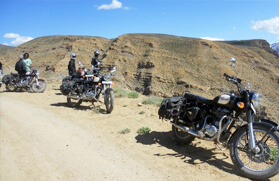 The entire track is best for adventure enthusiasts, bird watchers and wildlife photographers. You can spot horned rhinoceros, sloth bear, fresh water dolphin, deer of various species, wild boar, leopard, Gharial crocodiles and marsh mugger. Also, you can see several species of birds. 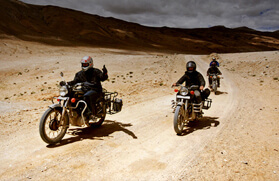 At Trekking in India, we offer exciting Kumaon Motor bike tours to meet the growing needs and expectations of adventure lovers who want to make their holidays more daring and interesting. 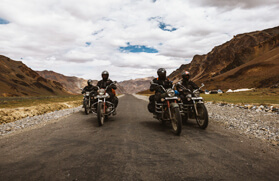 Our motor biking adventure tours in the Himalayas of Kumaon include visiting remote villages, crossing high mountain peaks and closely watching the rich culture of the people of Kumaon. Early in the morning after breakfast ride your bike up to Corbett National Park. Arrive at the Park by noon and check in to the Nature Resort. After lunch, take a guided nature walk and also visit the famous Garjia temple on bike. Overnight stay at Nature Resort. Early morning after breakfast left your bike at the resort and takes a jeep safari to Dhikala Forest Lodge. On the way you can see lots of wild animal. On arrival check in and lunch. After leisure get ready for evening safari to Chaud, here you can spot elephant, wild bore and if you are lucky you can spot the tiger also. Back to the lodge. Evening tea and snacks. Dinner and overnight stay at DFL. Early in the morning get ready for another jeep safari. After breakfast drive to drive back to Corbett. Lunch and evening rest at resort. Overnight stay at Nature Resort. In the morning after breakfast we will ride our bike up to Binsar, enroute we drive through the sanctuary. Binsar offers a lot of opportunities to the avid birders and photographers. Overnight stay at Binsar. A steep ascent on a hillside replete with villages, streams and waterfalls brings you to a quaint little township of Munsyari, perched on a mountain face. 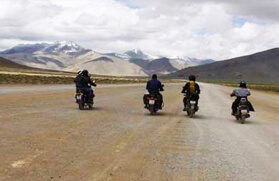 Munsyari commands fantastic views of the Panchachuli peaks and the Milam and Ralam valleys. The majority of the population is of the ethnic Bhotia race, a very tough breed, invaluable as guides and porters or the various treks that begin here. Overnight stay at hotel. Khaliya Top is situated approximate 11 Km from the Wayfarer's Resort, at a height of 11500 ft. This hilltop offers an incredible view of the Panchachuli peaks. The highly popular trek to Khaliya Top through dense forest and overnight stay in alpine tents is a must. For those fond of angling there is ample scope to fish trout and Mahseer in the Ramganga and Gori Ganga rivers within radius of 40 Kms. Separate arrangements for guide and packed lunch can be made. Guests are expected to bring along their own angling equipment. Today we will ride to Patal Bhubaneshwari (05 Hrs), spend 02 Hrs visiting Magmite / Stalmite caves which depicts the legends of The Mahabharata, the great Indian epic, and then to Chaukori. Chaukori a small Kumaoni Village has tea gardens with enchanting views of the Himalayas. The road to Chaukori is along the famous Berinag ridge. Overnight stay in a Tourist Rest House. Ride in the morning to Mukteshwar through narrow roads dotted with villages. This area is famous as the fruit bowl of the Kumaon. Apple, pear and peach orchards cover the hillsides with their splendid blossoms. Overnight stay at Resort. Ride back to Delhi in the morning. Arrive Delhi in the evening. Overnight stay.